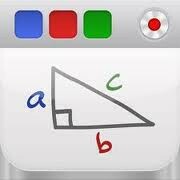 I am going to be teach you about the app pocket whiteboard. This app pocket whiteboard acts like a whiteboard you can write with a marker, erase like a normal board, and you can save and replay things that you done. The way you use it is going to the app and start drawingthe lesson, then press the save button and the lesson will go to you pictures. From your pictures you can can send to your email or text it to someone. I suggest that you get this app. It is the best .99 cents that you have ever spent I promise you. I suggest you get it before the price goes up. You write what you will be talking about in your lesson. Then you press the save button and go to your picutures. Finally you can go to your pictures and send, or you go back to the app and press replay and what ever you did it will show you. Saves the last drawing or lesson you have done, real looking marker and eraser, makes noise like a eraser or marker, and saves lessons in to your picture so you go to your picture and can send a message or email to someone the lesson.